Now, with that out of the way, let’s have a look at the people responsible for this- you can skip it if you want, I’ll have a BOLDED note for when the actual analysis of the story starts. 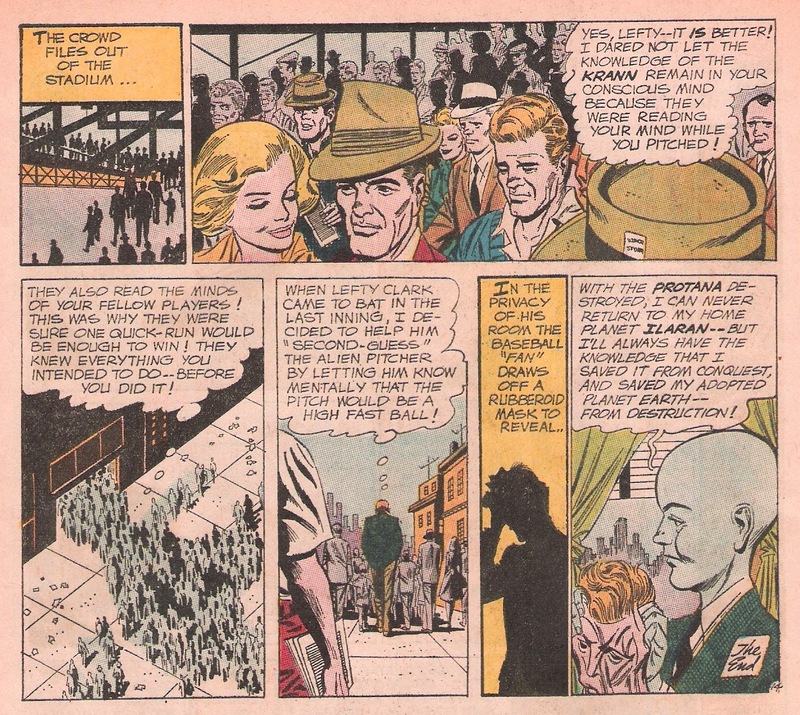 First off, the people behind this are extremely notable, as the story was written by Gardner Fox and penciled by Carmine Infantino. These two are icons of DC Comics, who were involved in the creation of many of the publisher’s most notable characters in one way or another. Infantino, meanwhile, is perhaps most notable for his involvement with The Flash- his fingerprints are all over the new TV series on the CW. 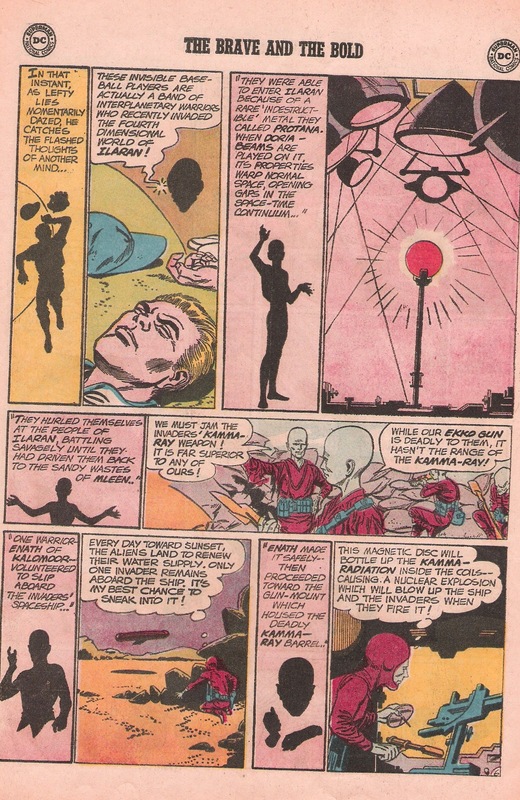 Characters like Barry Allen, Iris West, Captain Cold, Gorilla Grodd and Captain Boomerang all were initially drawn by him, as was Wally West, who would later go on to Barry Allen’s successor as the Flash in the comics.He also co-created Black Canary (who has appeared in various forms in the Arrow TV series) with writer Robert Kanigher and would later co-create the Barbara Gordon Batgirl with Fox. I’d like to thank the Internet for filling a lot of that in for me. OKAY, NOW TO LOOK AT THE STORY. WHO WAS THE BASEBALL TEAM THAT DEFIANTLY CHALLENGED THE WORLD’S CHAMPION JETS TO A WORLDS’ SERIES GAME? NO MAN ON EARTH KNEW — FOR THE MYSTERY “NINE” WOULDN’T EVEN BE SEEN! 1. The champion… New York Jets. Now, this came out in 1962/early 1963, so it was still before the NFL team was playing under that name (they were originally the Titans until the 1963 season). However, the Mets were playing by now, and it’s almost certain that Fox meant the “Jets” to be a stand-in for the Mets. So, after one of the worst seasons in the history of professional sports, the New York Mets got to be used in-disguise as world champions in a comic book. Yeah? 2. 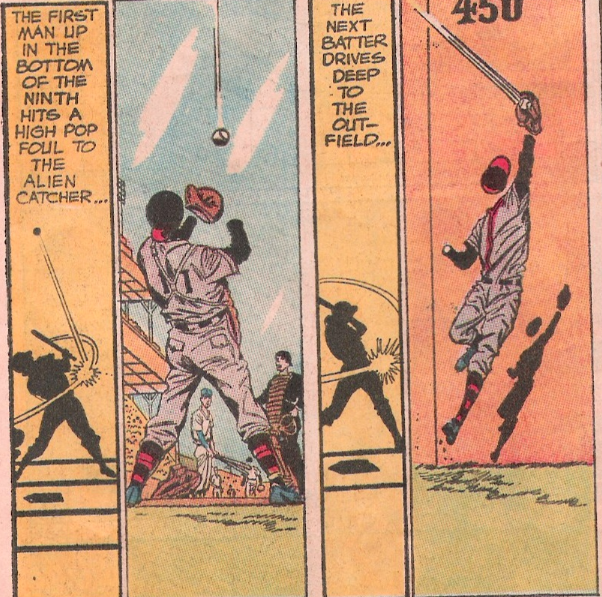 Man, look at that old baseball equipment that Infantino draws here. 3. The stadium they are in looks a bit like a mashup of the Polo Grounds and Yankee Stadium, but is probably just meant to be generic. Now, after this splash page, we go back to the beginning of this strange trip: earlier in the day, during the final game of the “World’s Series”. Yes, the “World’s Series”. Now, occasionally the “World Series” has been referred to as the “World’s Series”, but I’m guessing this is more just DC’s way of not having to worry about confusion or copyright or anything like that. We see the Jets win the series thanks to some clutch pitching from “Lefty Clark”, who strikes out the side with the bases loaded to win it. They celebrate, and also prepare to receive the actual pennant. Yes, this was back when there were actual pennants! And, what’s more, we find out they will receive their pennant right now, not on opening day of next season! 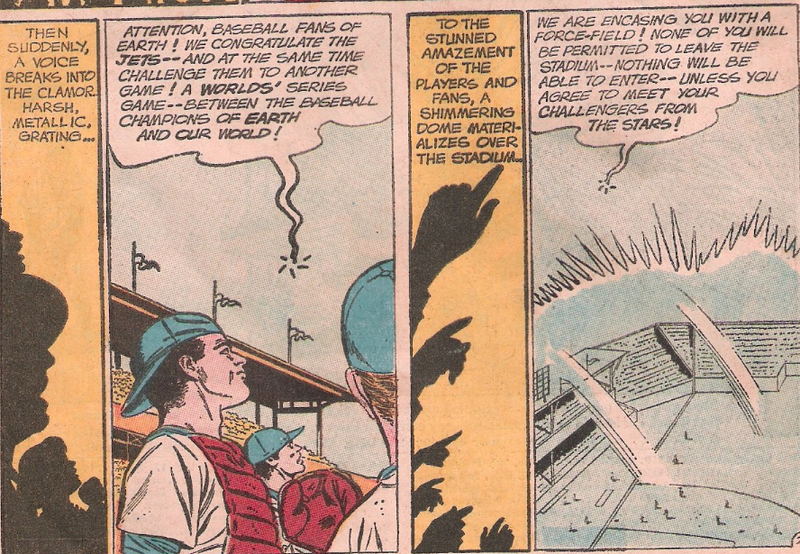 Yes, it’s true, some aliens have come and encased the stadium in a dome… to challenge the New York Jets to a baseball game. And, they say, they’ve come from over 50 lightyears away to do it! When confronted by this shocking revelation that mankind is not alone in the universe, the American people respond by… sitting at the TV. Well, better than taking to the streets in anarchy, flooding houses of worship and generally acting like the world was about to end, I guess. 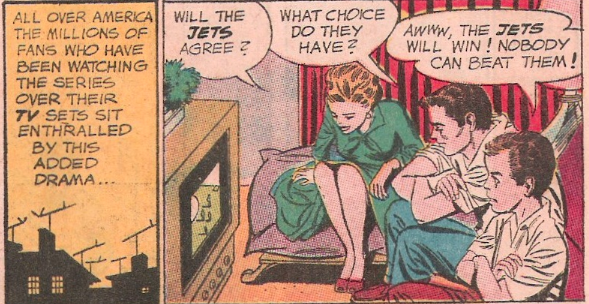 Anyway, the Jets agree (as if they have any choice), and the challengers from outer space take the field. As you know if you’ve looked at the cover or the first page of this story, they are invisible men- their uniforms visible, but their bodies not. The skipper of the Jets, having now seen his opponent, decides to stick with Lefty Clark, since he only pitched one inning in the first game. Man, I bet he didn’t expect to play a doubleheader when he woke up in the morning, huh? The invisible team strikes first. The leadoff man reaches on a single up the middle, then he gets to second when the next guy reaches base on a bunt single. The 3-hole drives the lead-off man home with a double, but then Clark is able to avoid further damage with a strikeout, a pop-out, and a grounder. The invisible men strand a man on third. Meanwhile, the Air Force is just kind of… sitting around. Ouch. Now, I’m sure that this will just fill Lefty with more determination, as he ignores obvious signs of head trauma and concussion and stays in the game, right? 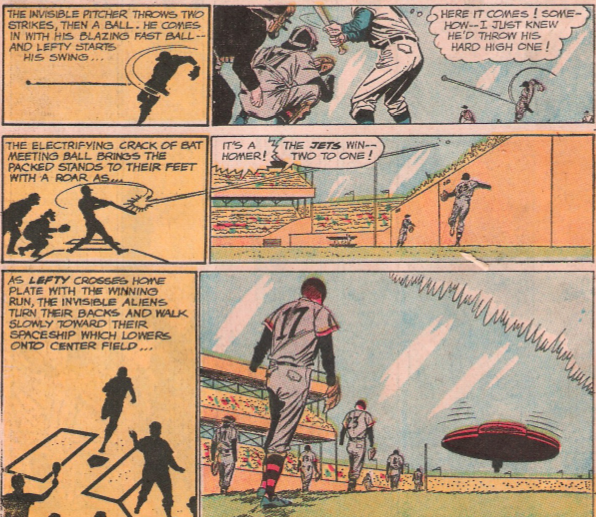 Well, sort of, because first, we must interrupt this unusual baseball story with a ALIEN SPACE BACKSTORY, courtesy of some sort of psychic transmission… oooooo! That last panel will be important. Above is just the first page in which we see the adventures of Enath of Kalomoor. 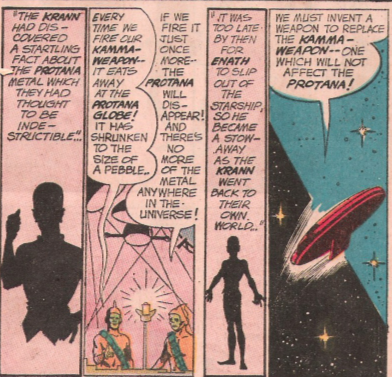 Basically, his folks have been getting attacked by the Krann warriors, who have Kamma-Rays and a metal called Protana, which make them unstoppable. Enath, however, discovers something startling about the Protana and the Kamma (“Protana and the Kamma”, of course, would make a great name for some sort of female hippie space-age band): the Krann are going to run out of Protana if they keep shooting the Kamma, so they need to come up with a more protana-efficient death ray! The Krann start guarding the Kamma-Ray to make sure it doesn’t accidentally fire away the last of their Protana. Enath takes advantage of this shift of resources to… steal the Protana. Yes, apparently, they basically moved all the guards away from the Protana. Whoops. So, Enath escapes, and then decides that the best way to make sure it isn’t detected is to hide it in some gold, which messes with the Krann’s sensors, or something. So, Enath heads to the nearest planet with gold on it. Three guesses on what that planet is, and the first two don’t count. 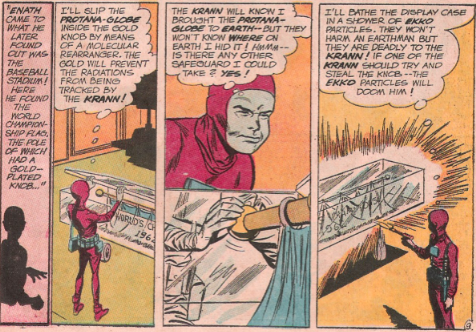 So, it turns out that the Krann then came to Earth to win the pennant and get their Protana sphere back, but to play baseball and win the pennant, they need to wear some sort of sunblock that has the side-effect of making them invisible. Yeah, this was basically a story that had an interesting image and then had to come up with some way to make it happen, why? Wait, 450 feet? Jeez, this is the Polo Grounds, isn’t it? Oh, who am I kidding? Of course he hits the walk-off home run to win the game. The last pitcher to hit a walk-off home run, by the way, was Craig Lefferts in 1986. 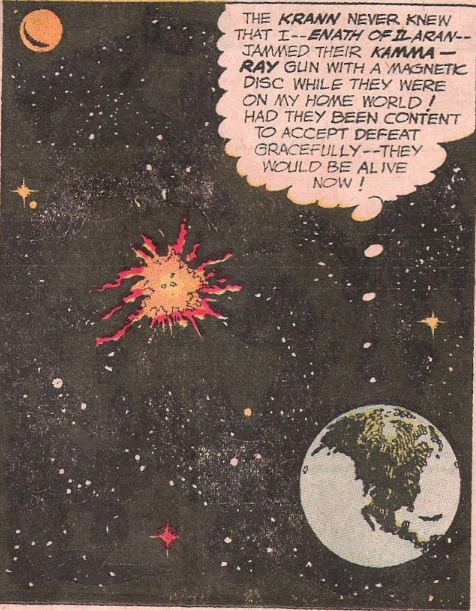 The Krann take the loss poorly, fly into space, prepare to death-ray Earth into dust but then are punished for their poor sportsmanship by blowing themselves up because Enath had plugged up their weapon with a magnetic disc earlier in the story (I told you that panel would be important!). 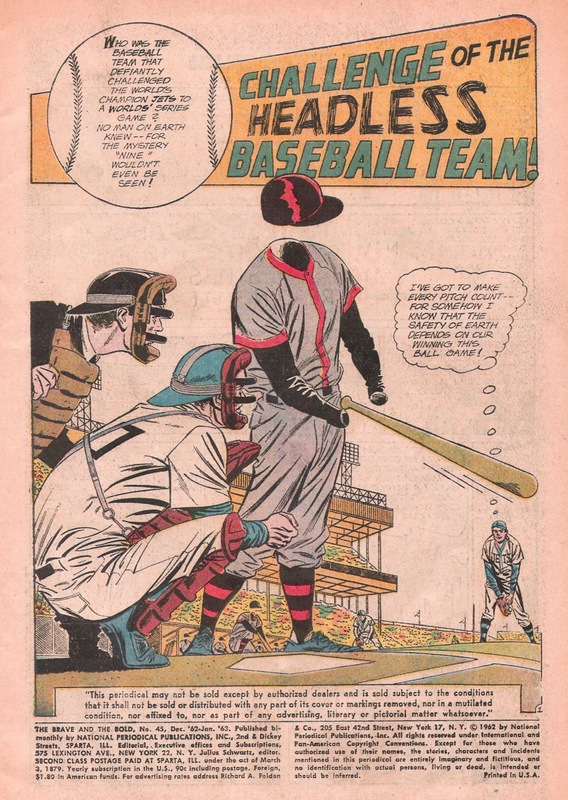 So… there you go, “Challenge of the Headless Baseball Team”. It’s fun. I mean, hardly groundbreaking and there are several leaps in logic, but the visuals are neat and the story does a good job of setting up plot devices (such as the pennant and Enath’s sabotage of the Krann ship) that end up paying off. Certainly, there have been far worse stories I’ve read on Bizarre Baseball Culture than this. This isn’t going to be the last Strange Sports Stories you see here at the Continuum, though… because NEXT TIME ON BIZARRE BASEBALL CULTURE, A 1970s STRANGE SPORTS TALE! 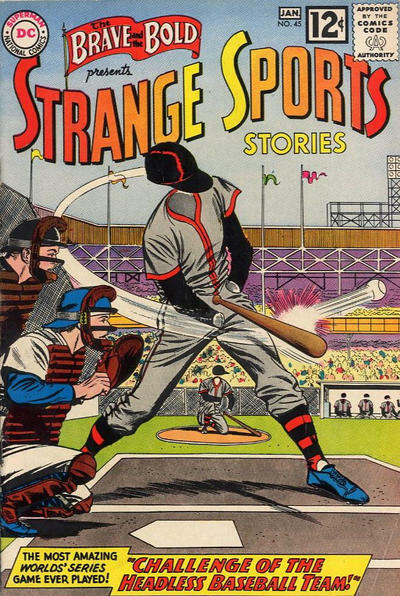 This entry was posted in Baseball, Books and all their spinoffs, Uncategorized and tagged aliens, baseball, Baseball comics, Bizarre Baseball Culture, Brave and the Bold, Challenge of the Headless Baseball Team, DC, DC Comics, Gardner Fox, Infantino, Jets, krann, Lefty Clark, protana, Sci-fi baseball, Strange Sports Stories, The Brave and The Bold #45 by danglickman. Bookmark the permalink. hilarious! headless — and handless, too.